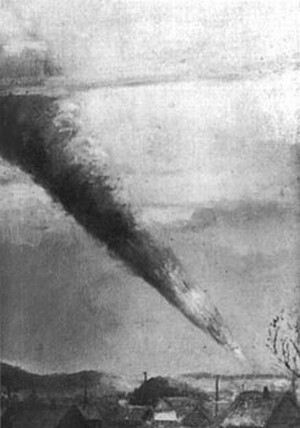 At about 10:38 AM on February 12, 1947, a "monster bolide" impacted in the USSR near the town of Sikhote-Alin, in the Soviet Far East north of Vladivostok. It was first noticed as a brilliant light in the daylight sky, bright enough to make the eyes burn as it hurtled downward at a steep angle. Trailed by a huge smoky train, the meteor streaked to earth, filling the sky with deep, reverberating thunderclaps and shaking the ground. 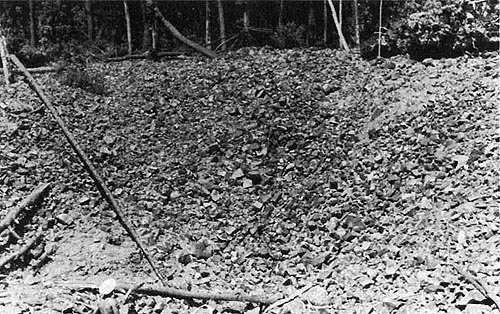 The meteorite, estimated to weigh as much as 100 tons, exploded into fragments which impacted over a wide area, blasting out more than 120 pits, the largest of which was twenty feet deep and ninety feet in diameter. Blocks of iron weighing up to two tons littered the landscape. It is unclear how much detailed information LaPaz would have had about this incident as of late 1948. As improbable as it may seem today, judging by comments he made in his papers, he clearly suspected at the time that this event, as well as other unusual meteors in 1946 and 1947, might have been caused by a man-made object. While it is now known that the meteor was traveling from the north-northeast to the south-southwest, the initial Soviet investigator on the scene, Krinov, stated that it was traveling north-northwest to south-southeast. The erroneous trajectory estimate may have led LaPaz to believe that the object was a missile coming from the western USSR. An excellent article on the incident can be found here.